Holiday PLEX & Omega Sale! - 15% Off! We're happy to announce that a holiday sale on PLEX and Omega time has just kicked off! 15% off Omega Time in the New Eden Store. 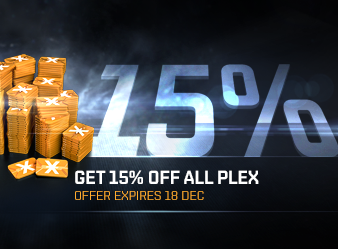 15% off all PLEX packages on the EVE Online Secure Website. This offer will be available through until downtime on December 18th, so be sure to get your PLEX and Omega Time as soon as you can!